A deadly crash over the weekend had neighbors on East 23rd Street in Kansas City concerned about the stop signs on their street. KANSAS CITY, Mo. 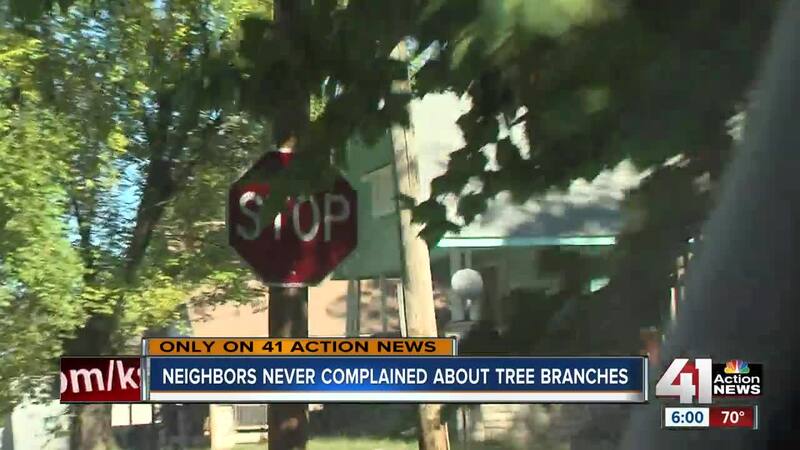 -- Although a police investigation is on-going, residents along East 23rd Street in Kansas City are concerned the stop signs were covered in trees, making them nearly impossible to see. Lashay Witherspoon has only lived in the neighborhood for two months and already calls the street she lives on dangerous. One person died Saturday in a three-car wreck at 23rd and Brighton. "The other day there was a major car wreck," said Witherspoon. "I wanna say because of trees like this blocking the stop sign." She said at first, she didn't even see the stop sign when she moved to the area. "No, honestly I did not at all. Until one day, I was coming home and oh my gosh, I didn't know there was a stop sign there," said Witherspoon. According to the 311 website, there have been no one has called in to report the problem. A photo on Google Maps from September 2014 shows the same problem. Witherspoon said her street is bad overall. "Come cut this tree down, honestly. It will be a lot of help. More vision for everyone to see and the street would be way safer," said Witherspoon. After the short phone call with 311, Public Works employees came out and cleared branches on both Poplar and Brighton Avenue. The call from 41 Action News was the first call about the branches. "I can see now that they came and fixed it," said James Tate, a 15-year resident of the neighborhood. And he will now call 311 when the branches grow back. Police said it will take several weeks before they know what caused the crash, but the victim was in his 60s. His name has not been released.